Why Not Call Him, "Mr. Putin?" 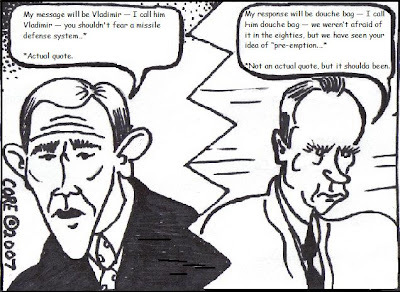 PRAGUE, June 5 — President Bush delivered a double-barreled message to President Vladimir V. Putin of Russia today, two days before the leaders are to meet in Germany, by assuring Mr. Putin that he has nothing to fear from a missile defense system but also chiding him for derailing democratic reforms. On the first day of his eight-day tour through Europe, Mr. Bush wasted little time in prodding Mr. Putin to cooperate with the United States on a proposed network of radar and missile defenses in Poland and here in the Czech Republic. But he also risked provoking the Russian leader, who is already up in arms over the missile defense plan, by taking Mr. Putin to task over human rights. “My message will be, Vladimir — I call him Vladimir — that you shouldn’t fear a missile defense system,” Mr. Bush said during a morning appearance with leaders of the Czech Republic at Prague Castle, high on a hill overlooking the city. Seriously, first he gropes the German Chancelor, then he calls the British Prime Minister's name as if he was calling a bassett hound, and now this. But what more should we expect from this guy?